Welcome to Something About Coins! 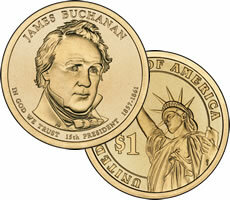 Today's coin articles start out with news about the U.S. Mint. First, another newly designed Presidential Dollar will hit the streets this month, and a story about the latest quarter ceremony is next. Gold is the main topic for the remaining ones, including the Mint's American Gold Eagle July output, some collecting advice, and San Francisco's older Double Eagles. Enjoy!